This Friday will be 3 weeks since my diagnosis. At the young, sweet, tender age of 34 I've been given this scary diagnosis. When I got the news and many days later, even now to an extent, I just felt lost: uninformed and blind and unsure. It's like with any fight, you enter the battle thinking you can win. That you have a chance. And sometimes you are in the midst of the event and realize maybe you're in over your head. Maybe this win isn't as sure as you once thought it to be. With the diagnosis so fresh, I'd say about 99% of my thoughts are positive. I just learned who/what the opponent is and I know some people (doctors) that have good tools and techniques to help me in the fight. Mostly, I feel confident, aside from the anxiety of wanting to just get on with the fight so I can slink away exhausted with my battle scars much sooner rather than later. But it's a process. There's more consultations and scans to be had and opinions to be made at this point. And then there's that 1% of thoughts that creep in. The thoughts of "What if I do all this and it's for nothing?" or "Does chemo really do more harm than good? And what other choice do I have?" and a few more that all have to do with mortality. 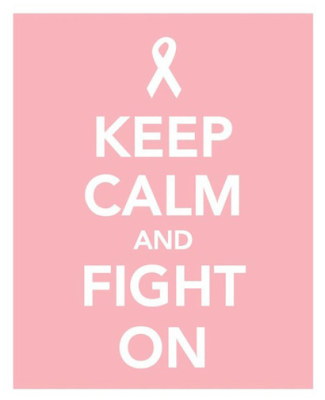 I actually have an aunt that was diagnosed with Breast Cancer in the mid-90's. She's still alive and well today. But I take her outcome with a grain of salt. Cancer seems to be tricky. It seems that more often than not, no two outcomes are the same. So, it's a lot that I try not to worry about. Daily I begin sticking it in the far back corner of my mind. But by mid-day I usually have several internet tabs open reading research papers, excerpts from scientific journals, and of course stories from survivors. I sleep well knowing that ultimately, what will be will be.